Facelift or Neck Lift: Which Is Right for You? As we age, gravity takes its toll on our bodies. Our once youthful and glowing skin begins to stretch, sag and pale with years of exposure and deterioration. This can leave many middle-aged and older adults feeling disconnected from the reflection they see in the mirror. The good news is, many of these signs of aging are reversible with cosmetic surgery. While surgical procedures cannot create an entirely new look, they can restore your current skin to its glory days, shaving years off your appearance. The type of facelift you choose is largely dependent on age and the features of your face you’d like to restore. Traditional facelift/full facelift – This is a combination of the mid-facelift and lower facelift, restoring the full youthful appearance of the face from the nose and cheeks to the chin and jawline. Mid-facelift/cheek lift – This procedure gives you rounder looking cheeks, elevates the middle portion of the face and eliminates wrinkles. Lower facelift – The lower facelift fixes jowls, loose and sagging lower face skin, marionette lines (from lip to chin) and nasolabial folds (from nose to lips, under the cheek) by repositioning tissue and pulling skin taut. Mini facelift/weekend facelift/S-lift – This is a less intense form of the facelift that causes less scarring, requires less recovery time and provides more subtle results. It is called an S-lift because of the S-shaped incision made in front of the ear. Younger people with less sagging skin or wrinkles may opt for this procedure. 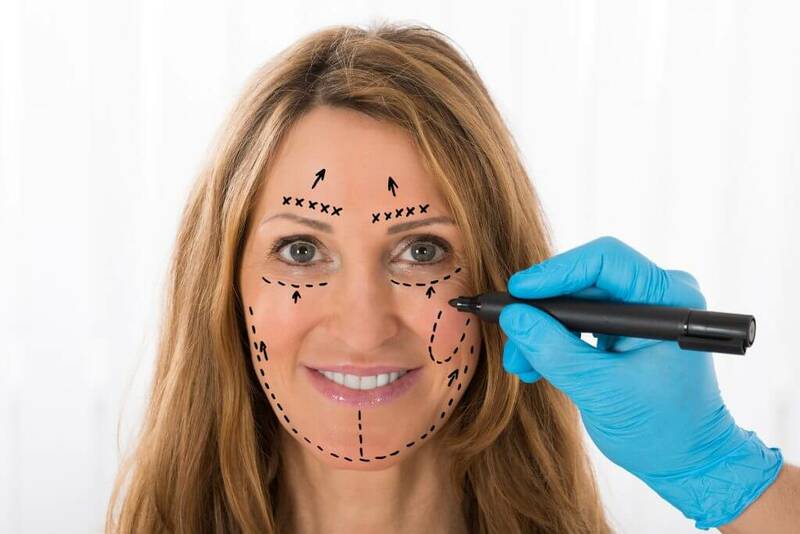 The traditional facelift provides the most drastic change in facial appearance and also requires the largest incision and longest recovery time. At the beginning of the procedure, you will be given general or local anesthesia. Your surgeon will then make an incision from your temple area down and around the front of your ear, then toward the back of your head. Incisions are kept along the hairline, concealed under the hair and along the natural contours of your face for the most inconspicuous scarring possible. If you are only having a mid-facelift, your surgeon may prefer incisions along the bottom eyelid and the gums and a smaller incision at the temple area of your hairline. Next, your surgeon will lift your skin from the underlying muscles, fat and tissue. They will then use sutures to lift the SMAS (superficial muscular aponeurotic system), a collection of fibrous tissue located in the lower portion of your face. Readjusting the SMAS, which has slackened and fallen with gravity, is key to changing the overall appearance of the face. Once the surgeon has repositioned the SMAS, they will lay the skin over the new face structure, making sure to tighten it enough that the skin looks young. There will be excess skin, which is cut and removed. The surgeon will then suture or glue the skin so the healing process can begin. A patient may be ready to go back to work within two weeks, although regaining facial sensation and feeling like your true self may take a few months. Before the neck lift, you will undergo sedation or general anesthesia. Your surgeon will then make an easily concealable incision that begins at the sideburns and trails down around your ear to the back of your head. If you prefer a smaller incision, your surgeon may limit it to the area behind the ear. You will also need an additional incision beneath your chin if you are having fat redistributed or fixing the underlying muscles of the neck. During the procedure itself, you may elect to have liposuction to remove excess fat. If you are experiencing neck banding, where cords develop vertically around the throat area, your surgeon can tighten the platysma muscle that runs from your jaw to your collarbone, reducing the bands. Your surgeon will then reposition fat and muscles much like they would during a facelift. Once the tissues of your neck are reshaped, your skin will be pulled taut. Any excess skin will be removed and sutures or glue will be placed at the incision site. Most of the confusion surrounding facelifts and neck lifts can be attributed to how they are often performed together. Unless you are experiencing aging only in the face, or only in the neck, getting a combination facelift and neck lift may be the right solution for you. If you are self-conscious about the appearance of your face or neck, you can take steps today to reduce your discomfort and regain body confidence. At Virginia Surgical Arts, Dr. Sergio Vendetti and his team provide facial cosmetic surgeries to residents in the Virginia Beach area. If you feel a facelift or neck lift may be the right solution for you, schedule a consultation by calling our office at (757) 430-7690 today.